House Speaker Paul Ryan has until June 1 to file to run for reelection to the US House from Wisconsin. So far he hasn't, and he continues to say that he hasn't made up his mind. Some think he won't run again, considering the forecast of heavy weather and considering how there have already been two surprising blue flips in Wisconsin this year (here and here, just this week). his most difficult race ever. 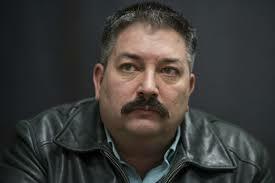 Wisconsin ironworker Randy Bryce announced his campaign to unseat Ryan all the way back in June of 2017 with an announcement video that got the attention of national Democrats including the DCCC. Bryce has since raised almost $5 million, so he's definitely going to be a playah. He calls himself IronStache on Twitter for obvious reasons -- that horseshoe of facial hair and his laboring life as a union ironworker. He's also a veteran of the army and a cancer survivor, and he fits that Wisconsin district now perhaps better than Paul Ryan does, especially as Ryan has spent less and less time there and stopped holding public town hall events. Bryce says on his website, "My values are my neighbors’ values, and we know that Washington has gotten way off track. Whether it’s healthcare or jobs, national security or education, our democracy or the environment – there’s not one issue where Paul Ryan and Donald Trump are headed in the right direction." The Iron Stache now has a primary opponent, a school teacher and member of the local Janesville school board named Cathy Myers. (Janesville is Paul Ryan's hometown.) She's also running as a blue collar warrior: "So if you think now is the time for a Member of Congress to represent the truckers, the teachers, the factory workers, and the small business owners, I am asking you to join this campaign." She's perhaps the more orthodox progressive. Bryce can probably overpower her with his impressive war chest plus his long head start, though Sheryl Gay Stolberg reported in yesterday's NYTimes that Myers is gaining support. We'll have to wait until August 14 to see how this Democratic primary turns out. In the meantime, Paul Ryan -- assuming he runs -- will have his own repeat primary contest with a white nationalist and anti-Semite, Paul Nehlen, who lost to Ryan by 68 points in 2016. He'll easily beat Nehlen again, but the fall showdown may not be so easy, whether it's Randy Bryce or Cathy Myers facing him. A Bob Rucho Slap-Down in NC Senate District 34?